Deadpool is living the lie! A brutal massacre in Mexico leaves hundreds dead, but becomes an international incident when one psychotic, mouthy mercenary walks away from the carnage. It's Wade Wilson, and he's got some 'splainin' to do! Always a man of the people, Deadpool uses the opportunity to shed some light onto his true origin as a military grunt and patriot who volunteered for the human experimentation of the Weapon X project to become a super-soldier for his country. But wait - that doesn't sound like the foulmouthed, wisecracking, hard-partying, misanthropic mercenary we all know an love. The truth is all a matter of perspective in this revealing look at the Deadpool's history and his broken mind. Who really hides beneath the red-and-black mask, and what really happened in Mexico? 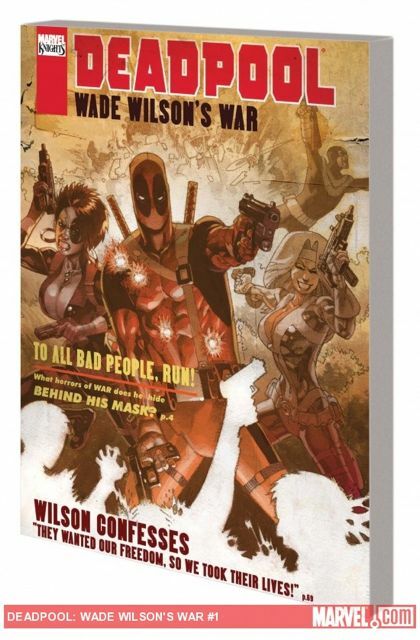 Collecting DEADPOOL: WADE WILSON'S WAR #1-4.